Among the myriad uses for a laptop is giving presentations using PowerPoint or, for Mac users, Keynote. In fact, for many notebook owners, it’s a primary use. Those who move around while speaking know the value of being able to control your presentation from across the room or stage, and Apple's recent laptops include an infrared sensor that provides basic remote control of your slides using Apple's Remote. But the Remote, while compact and light, lacks features and works only if you’ve got a direct line of sight between the remote and your MacBook’s infrared sensor. If giving presentations is one of your primary duties, Targus’s Bluetooth Presenter is a more-capable alternative to Apple’s Remote. At 5.1 inches long, 1.7 inches wide, and 1 inch thick, the Presenter is chunky, but that size makes it large enough to feel solid in your hand, but small enough that even those with small hands should be able to hold and use the Presenter comfortably. The sides and bottom of the Presenter are covered in matte plastic that offers a bit more grip than the glossy finish of Apple’s Remote, and at just under 4 ounces, the Presenter feels considerably heftier without adding much weight to your laptop bag. The Presenter offers considerably more functionality than Apple’s Remote, split between two modes: Presenter and Mouse. You switch between these modes using a slider switch on the face of the remote. 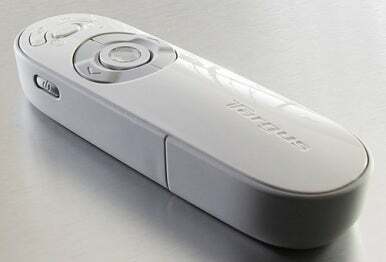 In addition to this slider, the remote hosts a circular button surrounded by two large arrow buttons, left and right; and two smaller buttons near the top edge. A rocker switch on the right-hand side lets you adjust your Mac’s volume level, and there’s a power button on the left. In Presenter mode, the large arrow buttons let you move forward or back in your presentation; the smaller button on the right starts your presentation; and the smaller button on the left blanks the screen during the presentation. 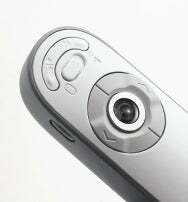 The circular button activates the Presenter’s built-in laser pointer. The Presenter’s Mouse mode worked better than I expected; I was able to control my MacBook’s mouse cursor adequately, despite the small size—less than half an inch across—of the sensor. However, you definitely lose accuracy compared to a mouse or the laptop’s built-in trackpad, and because the Touch Scroll is so small, it takes several swipes to move your cursor from one side of the screen to the other. In other words, you won’t want to use the Presenter as your primary input device; it’s for occasionally controlling your cursor during presentations. Targus’s driver is technically still beta software right now, but it worked well during my testing. 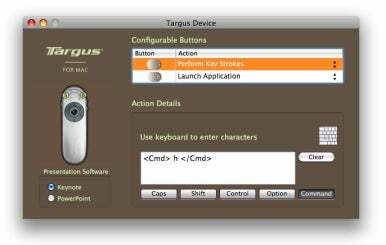 Using a new Targus pane in System Preferences, you can choose whether the Presenter’s two programmable buttons are configured for Keynote or PowerPoint (the two programs use different control schemes), and you can also choose custom actions for those buttons when the Presenter is in Mouse mode. Available actions include launching an application, performing a keystroke, running an AppleScript, as well as a number of predefined functions. Those functions include eject, print screen, select all, volume up or down, mute, Expose actions, Dashboard, play/pause iTunes, and back or forward in Firefox. Unfortunately, you can’t choose different actions for different programs; you get only a single custom action per button. For a configuration example, I set the left programmable button to perform the keystroke Command+H in Mouse mode, setting the right programmable button to launch Keynote. With these settings, if I need to do a live demo during a presentation, I just flip to Mouse mode and press the left programmable button to hide Keynote; when I'm done, I press the right programmable button to switch back to Keynote, right where I left off. The Targus software’s interface is somewhat confusing. When I first attempted to configure the Presenter, I interpreted the interface, shown at right, as letting you choose different custom button settings for Keynote and PowerPoint. However, these settings are independent: first you choose which presentation software you use, which determines the behavior of the various buttons in Presenter mode; then you configure the custom button settings for Mouse mode. The Presenter isn’t the most-configurable presentation remote I’ve seen, but it offers a good deal of functionality while keeping the number of buttons to a minimum. (Some remotes offer so many buttons that it's difficult to keep track of which is which—not good when giving an important presentation.) In addition, the buttons the Presenter does provide are shaped obviously and arranged intuitively; it’s easy to use the remote by feel without having to worry that you’re going to accidentally press the wrong button. It’s not an inexpensive accessory, but if you’re a Keynote or PowerPoint pro, it's definitely worth checking out.